Want to let Activity Roulette help you decide while on the go? If you have a Windows Phone, you can do just that with the Activity Roulette app - exclusive to the Windows Phone. Choose from a variety of roulettes to spin or create your own, view your spin history, or spin a "quickie" - all from your Windows Phone. 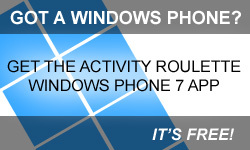 The Windows Phone 7 Activity Roulette app is 100% free.